Wilson Daily Times, 25 August 1934. Saint Mark’s Episcopal Church, 106 South Reid Street. This building replaced an earlier one on the site. 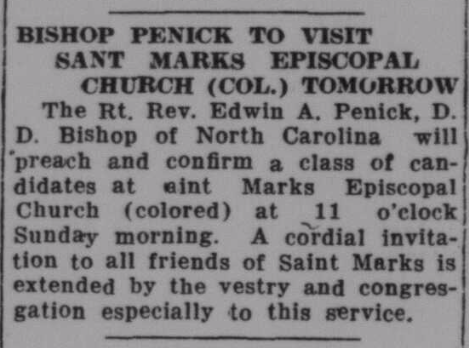 Saint Mark’s sanctuary now serves its historic African-American congregation as well as a Latino mission, La Iglesia de la Guadelupana. Photo by Lisa Y. Henderson, February 2019. ← Darden v. Robert G. Lassiter & Co., 198 N.C. 427, 152 S.E. 32 (1930).